Inspiration for crochet projects seem to be coming from all directions lately. They have all been pointing to Easter and Spring for me. Gee, I can’t imagine why, wink wink. I have only been lamenting it’s seemingly slow arrival for months now. I have seen the rare and elusive hare in several locations on the web. He is playing hide-and-seek in my dreams as well. It’s a sign…a sign I must make my own feeble attempt to capture his image for myself. So, without further ado, I bring you my new friend, The Easter Bunny. He turned out adorable ~ crooked nose and all! The Easter baskets for the munchkins this year will be chock-full of yarny goodness. 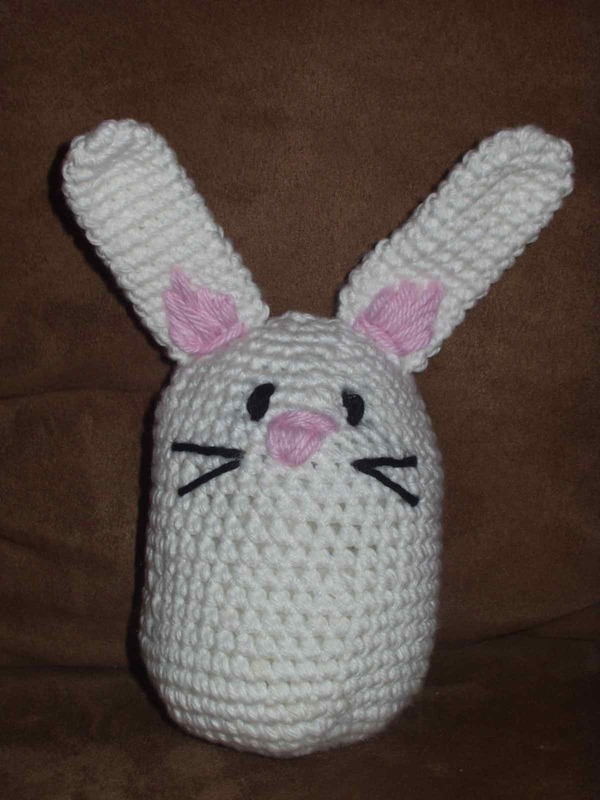 Although, I have to admit, I am getting kind of tired of amigurumi projects. Well, not really tired of them, more a feeling of been there, done that, now ready to move on for awhile. I think it is time to really pour on the gas to get the last of them done this weekend. If I can complete it soon and not drag it out another week, I won’t be SICK OF THE PROJECT. When I get SICK OF THE PROECT I tend to never return, and I think I want to return to this someday. There are multitudes of fun things to make with amigurumi, but I think I am going to merely sprinkle them into my hooking instead of undertaking a dozen of them at once. They really are a nice diversion from the socks that take 2 weeks, or the months-long undertaking of afghans. And I still have my long list of WIPs to accomplish, as well as the Great Spring Craft Quest, which I must admit has taken the very last back-seat on the bus that is my crafting.